CMB is thrilled to welcome returning artists Zenas Hsu, Janny Joo, Jessica Chang, and Laura Gaynon for its eighth season in 2019! With a sound palette ranging from a ‘commanding tone’ to ‘delicate sentiment’ (Calgary Herald), Taiwanese-American violinist Zenas Hsu leads a vibrant career filled with chamber music, orchestral leadership, and education. He is a founding member of Chamber Music by the Bay, a California-based interactive music series that reaches over 2,000 people annually. He is also a founding member and concertmaster of Phoenix, an orchestra based in Boston focused on providing social and accessible concert experiences in creative venues. Zenas is a frequent guest artist with A Far Cry, Bard Music West, and the Wellesley Chamber Players, and has performed as a featured musician at the Four Seasons Chamber Music Festival, Hayden Chamber Music Series, Halcyon Music Festival, and Monadnock Music Festival. He has performed world and national premieres of works by Robert Honstein, Philip Glass, Matthew Aucoin, Jesse Montgomery, Lembit Beecher, and others. This year, his involvement with A Far Cry has included a Grammy nomination for their ‘Visions and Variations’ album. His passion for chamber music was nurtured by members of the Borromeo, Brentano, Cleveland, Guarneri, Shanghai, and St. Lawrence String Quartets, and with such artists as Lucy Chapman, Gil Kalish, Meng-Chieh Li, Robert McDonald, and Susan Bates. Zenas has also collaborated in performance with Steve Mackey, Anthony Marwood, Itzhak Perlman, Vivian Weilerstein, Jörg Widmann, and members of the Brentano, Cleveland, Parker, Juilliard, Mendelssohn quartets and the Peabody Trio. Music festival appearances include Yellow Barn, Four Seasons Chamber Music Festival, Banff Chamber Music Residency, Lucerne Festival Academy, Perlman Chamber Music Workshop, Taos Academy of Music, Music Academy of the West, Icicle Creek Chamber Music Institute, and New York String Orchestra Academy. A native of California, Zenas received his early training in the preparatory division of the San Francisco Conservatory of Music. He was accepted at age sixteen to the Curtis Institute of Music for his Bachelor of Music degree, and received his Master of Music and Graduate Diploma degrees from the New England Conservatory of Music. His teachers include Wei He, Ida Kavafian, Nicholas Kitchen, and Donald Weilerstein. Violinist Janny Joo is a multifaceted musician who is equally at home in chamber, orchestra, and solo recital settings. She is the founding member of the Meadowlark Piano Trio, and enjoys performing works from the established repertoire as well as championing works from contemporary composers with the trio. An active chamber musician, Janny has performed with such artists as Bayla Keyes, Cho-Liang Lin, Hsin-Yun Huang, Desmond Hoebig, Allison Eldredge, William Fitzpatrick, and Norman Fischer. She has served as the concertmaster of numerous orchestras, and is currently the concertmaster of Symphony Nova and Associate Concertmaster of Phoenix Orchestra. She also plays professionally with Boston Ballet and Boston Philharmonic. Janny is passionate about teaching and coaching the next generation of musicians, and teaches violin as well as theory classes at the Boston University where she is currently pursuing her Doctorate degree in Violin Performance. She received her M.M degree from Shepherd school of music at Rice University and her B.A degree with minors in Math and History from University of Nebraska-Lincoln. Her primary teachers include Bayla Keyes, Cho-Liang Lin, Hye-Yung Yoon of the Chiara String Quartet, and Hal Grossman. In her free time, she enjoys ballroom dancing, horseback riding, traveling, and photography. 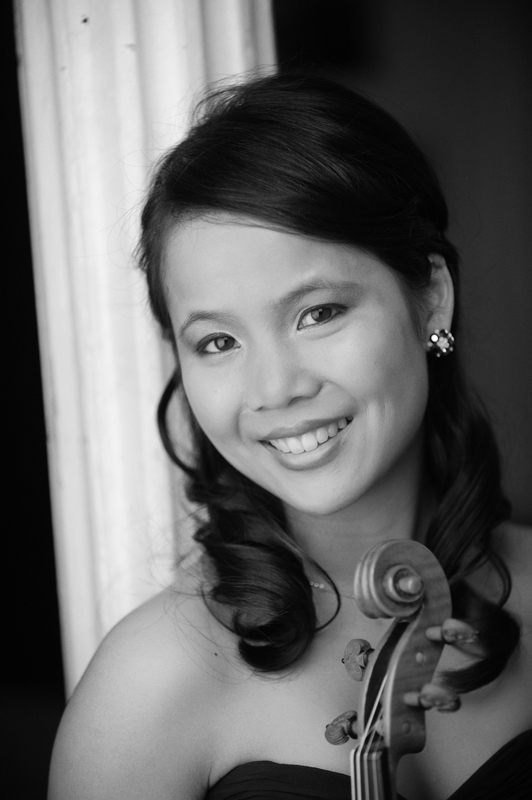 Violist Jessica Chang leads a versatile career as a sought-after chamber musician, recitalist, and educator. As the Founder and Executive Director of Chamber Music by the Bay, Jessica performs interactive concerts for diverse communities throughout the San Francisco Bay Area. Her work as a teaching artist has led to concert residencies, most recently with Project 440, the Savannah Music Festival, and Music from Angel Fire. She has also served as violist of the Afiara Quartet, with whom she toured North America, including a visiting faculty residency at The Banff Centre in Alberta and residency as the Glenn Gould School Fellowship Quartet-in-Residence at the Royal Conservatory of Music in Toronto, Canada. Jessica has performed as a chamber musician in concert tours throughout North America, Europe, and Asia. Her performances have been broadcast on American Public Media’s “Performance Today,” WYNC, WHYY, and WQXR Public Radio. Highlights from recent years include collaborations with Roberto Díaz, Pamela Frank, Scott Yoo, Christoph Richter, William Bennett, Itzhak Perlman, Joseph Silverstein, Toby Appel, James Campbell, members of the Orion and Guarneri Quartets, and members of the Philadelphia Orchestra, New York Philharmonic, and Berlin Philharmonic. Her festival appearances include Festival Mozaic, Juneau Jazz and Classics, Music from Angel Fire, International Musicians Seminar Prussia Cove, Open Chamber Music Prussia Cove, Perlman Chamber Music Workshop, Tanglewood Music Center, Taos School of Music, Verbier Festival, the National Arts Centre of Canada, and Aspen Music Festival. ​Jessica is a graduate of Yale University, where she received her Bachelor of Arts degree with honors and distinction. She also holds an Artist Diploma from the Curtis Institute of Music as the recipient of the William A. Loeb Fellowship, and a Master of Music degree from The Juilliard School. Jessica studied with Heidi Castleman, Steven Tenenbom, Roberto Díaz, Michael Tree, Misha Amory, Daniel Panner, Jodi Levitz, Jesse Levine, and Jenny Rudin. Her chamber music mentors include members of the Guarneri, Borromeo, Brentano, St. Lawrence, and Orion Quartets. A highly sought-after chamber musician and teacher, Jessica maintains a private studio in the San Francisco Bay Area. She performs frequently with ensembles including Ensemble San Francisco, the Ives Collective, and Chamber Music Silicon Valley. Jessica currently serves as the Executive Director of Chamber Music by the Bay, faculty member at California Music Preparatory Academy, and leads a dual career as a tech lead for security culture at Dropbox. 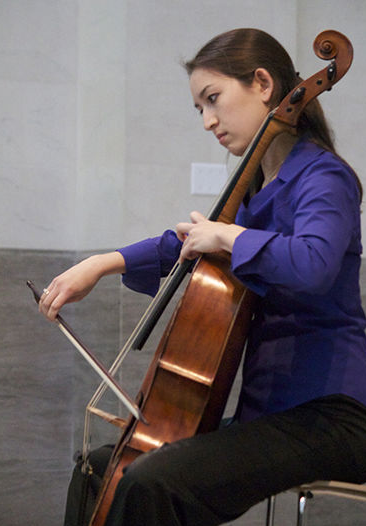 Laura Gaynon is a passionate performer of both modern and baroque cello based in the San Francisco Bay Area. Laura has performed with the American Bach Soloists, with the conductorless orchestra One Found Sound, and as a member of the baroque ensemble MUSA. As a chamber musician, she has collaborated with Vera Beths, Tanya Tomkins, Elizabeth Blumenstock, Kim Kashkashian, Krista Bennion-Feeney, Geoff Nuttall, Bonnie Hampton, Paul Hersh, and Ian Swensen. She is also Artistic Director of Bay Area Concerts at Home, a chamber music series that takes place entirely in the living rooms around the Bay Area. Festival appearances include the Valley of the Moon Music Festival, American Bach Soloists Academy, Toronto Summer Music Festival, Taos School of Music, the St. Lawrence String Quartet Seminar, and the 2012 International Piatigorsky Cello Masterclasses at USC. A devoted teacher, Laura has an active studio in San Francisco and enjoys bringing her love of music to developing musicians. As faculty with California Music Preparatory Academy, the Pacific Crest Music Festival, Chamber Music by the Bay, and Music Beyond the Chamber, she has performed for and taught students in and around Portland, OR, the San Francisco Bay Area, and Dunsmuir, CA. She also adores coaching at her orchestra alma mater, the Palo Alto Chamber Orchestra (PACO).